144 pages, 66 photos, 10 drawings, hardcover. 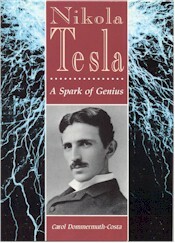 Published in 1994, this fine hardcover book is one of the more recent Tesla biographies. It contains a variety of high quality photographic prints showing Dr. Tesla and his work. While the book was created with the younger student in mind, the more mature researcher will surely find it to be of the greatest value.